The Ghost In The Shell franchise remains one of the biggest in the anime and manga world. Long before the disappointing live-action movie came and went, there was the manga, the 1995 Mamoru Oshii film and a number of TV series. The first TV series, Ghost In The Shell: Stand Alone Complex may not have quite had the same cultural impact of its theatrical predecessor but many hold it up as the definitive screen version of the cyberpunk sci-fi saga to date. 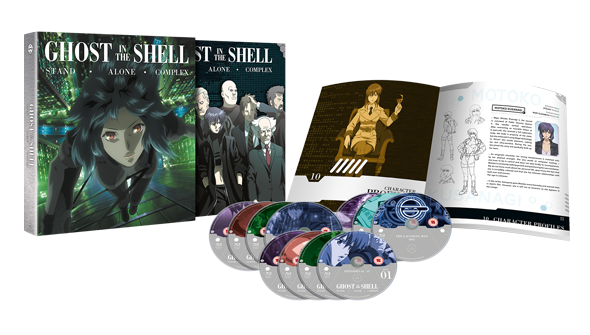 The complete Stand Alone Complex will be available on June 4, 2018 exclusively via Zavvi and will be limited to 1000 copies. We'd imagine it may be available (probably in non-deluxe form) elsewhere later but this is the only UK release of the series in HD for now. It will set you back £99.99- preorder here. They're sure to go fast- so don't delay if you want to guarantee your copy!